Roundleaf Bellflower is a perennial vine with stems hairless and angled. 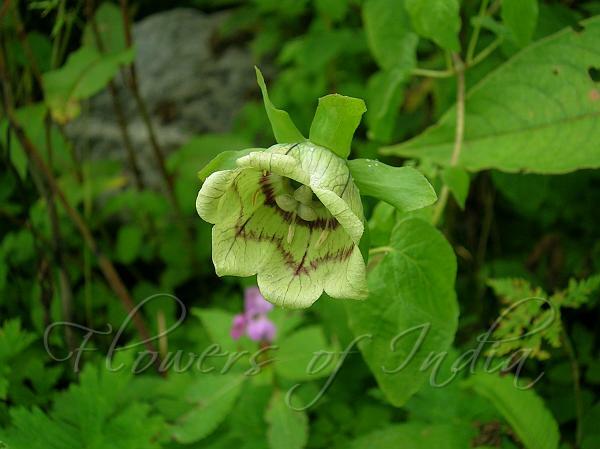 Flowers are wide-bell shaped, greenish white, veined with purple, with short lobes, 2-3 x 1.5-2 cm. Sepals are elliptic to lanceshaped, leaf-like, margin toothed, hairy, about 2 cm long, pointed to blunt. Flowers are borne in leaf axils or at branch ends. Flower-stalks are up to 6 cm, hairless to hairy. Leaves are stalks and alternately arranged. Leaf-stalks are up to 3 cm, hairless to sparsely hairy, oval to broadly ovate with rounded bases, some slightly heart-shaped. Leaf blade is 5 x 7 cm, margin toothed, tip blunt to pointed. Capsule hemispherical. Seeds c. 2 mm long, ellipsoid, minutely reticulate. 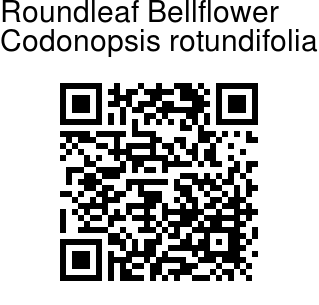 Roundleaf Bellflower is found in the Himalayas, from Pakistan to C. Nepal, at altitudes of 1800-3600 m. Flowering: July-August.